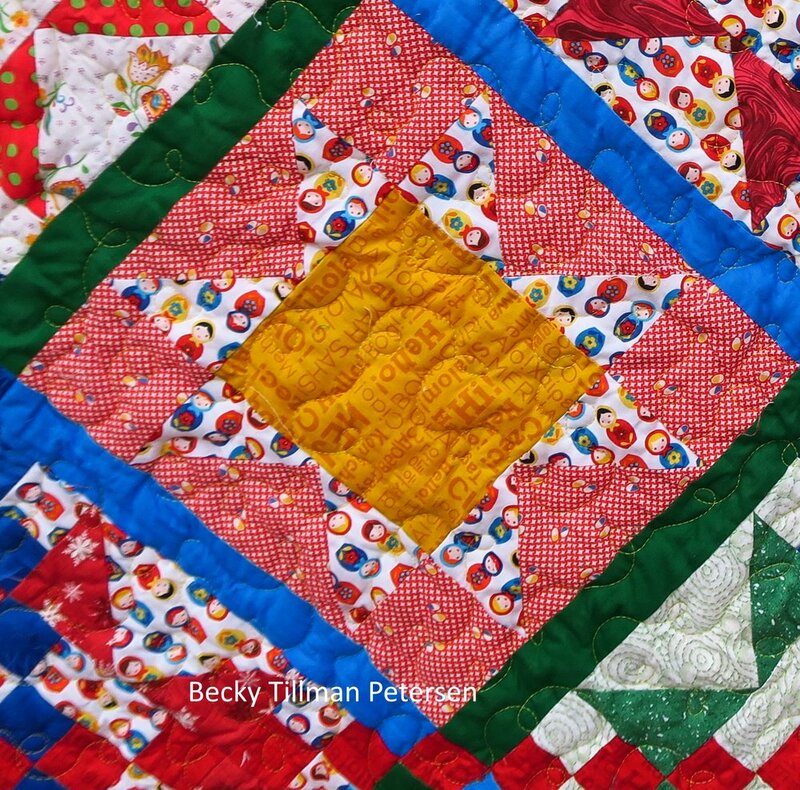 Remember when I said I wanted to have some time to focus on "friends and family" quilts - one of the reasons I wanted to have the charity quilts off my radar for a while? Well, this is one of them. I began this quilt last fall. Actually i finished the top well before Thanksgiving but then with my husband's broken leg, upcycled blues project and then charity quilts focus, I didn't get to finishing it like I wanted to. OK, OK. PLUS, it was BIG. Did I say, "BIG"??? Yes, the largest quilt I've made to date. Now that it's washed, it isn't quite as big, but before, yes, wow. The top was 110x125" or so. it's for some friends of ours here in Poland. The wife, another American, wanted something bright and cheery because the days are often so dark and dreary through the winter. So, I put my mind to it and designed this one - with the goal of bright and cheery. Plus, I used my Russian stacking doll fabric - and some Polish fabric. I backed it with a Polish backing fabric my sis and I bought - folk fabric named after the Kasubski region of Poland. I mentioned this quilt in a post back in November when I first made the top. I named it Stars a Lot because both of the main blocks are stars. The blocks with the chain running through it doesn't look as much like a star with it all together, but it actually is. It's plenty big enough for a pillow tuck! 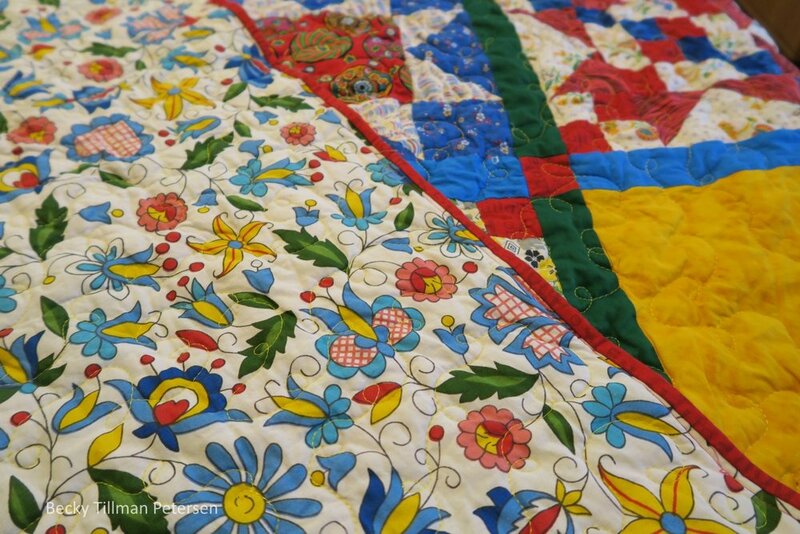 Here's a little closer view of what's included in this quilt. It's a bit "busy" - maybe busier than many people like. So, you can see...there is a whole lot more to this quilt than just "stars". I did write up the pattern - it's here. Just wanted to point out as of this writing, my sis still has some of this great Russian stacking doll fabric in stock. It's here! (the white with the small dolls) and I'm not sure why--I think it is adorable! This blue is a Polish cotton fabric I bought here - but it is a very expensive fabric - but gorgeous. Here's a nice closeup of the Riley Blake yellow fabric with foreign words on it. The theme of this being for my friends who are here in Poland is throughout this quilt! I quilted it with an all over loops since frankly, it was so big it stretched my ability to even think about something more complicated. I was so glad to see this one get over half way done! Then I was on a roll and just kept going! It's so busy that really, you can hardly see the quilting! And don't forget to take the time to check out what my sis has for you over in the store Here is some adorable stuff!